Lenovo Vibe K5 Plus And Vibe K5 Note To Launch In PH Next Week! Home / lenovo / mobile / news / Lenovo Vibe K5 Plus And Vibe K5 Note To Launch In PH Next Week! After releasing the Vibe K5 last month, Lenovo is set to complete the rest of the midrange multimedia centric Vibe K5 Line in the Philippines next week. It includes the K5 Plus and the K5 Note. 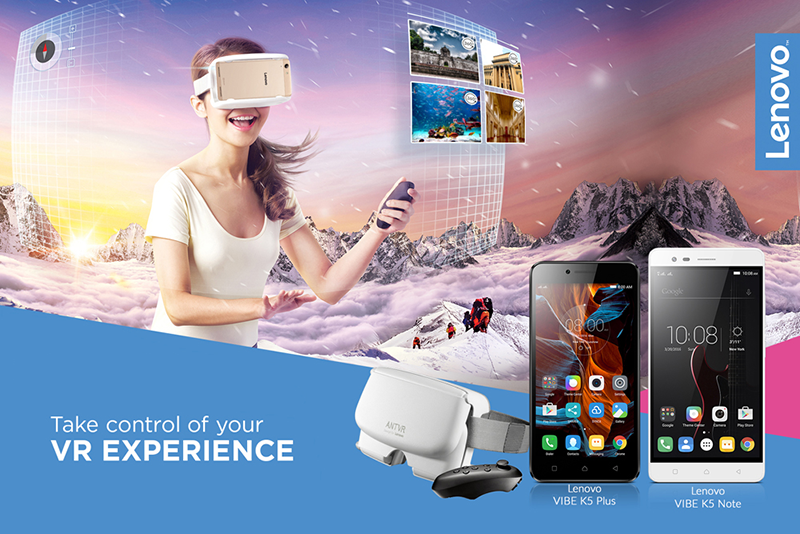 Related: Lenovo Vibe K5 Pro And Vibe K5 Note With Free AntVR And Control Launched In PH, Priced At 8,999 And 11999 Pesos Respectively! Like the K4 Note, it appears that Lenovo will add the AntVR once more with the K5 Plus and K5 Note. Based on the image, it appears that it'll be an upgraded bundle as there might be a VR controller included. Anyway, for now, here's the rest of their specs. The rest of the missing details like pricing and availability will be revealed in its July 27, 2016 launch. Stay tuned for our full report and hands on experience.